Finally we’ve got the next chapter in Marvel’s 2016 event, Civil War II. While Issue #2 was a little flat by comparison to the huge first issue, I’m pleased to report that Civil War II #3 is (in my humble opinion) right back up there. This one is worth keeping under wraps and spoiler-free, suffice it to say that there is sufficient plot to spoil in this issue and the Superhero Civil War we’ve all been waiting for is rapidly escalating beyond a simple moral disagreement between Tony Stark and Carol Danvers. 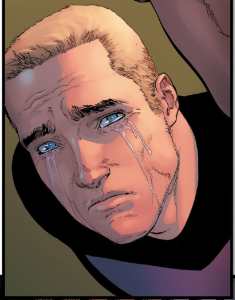 Continuing his unbroken streak of drawing superhero tears, Marquez turns his attentions to Clint Barton this time. At this point in time Tony Stark is certainly the major protagonist, but I’m thoroughly enjoying the use of cutaways and juxtaposition to really build a compelling and visually interesting drama throughout the series, even if courtroom scenes do make me remember She-Hulk’s brilliance in Issue #0 and her tragic treatment the following week. In the supporting comics this week, Gods of War is my pick as a more stand alone series while Spider-Man is up there with the alternate week X-Men tie-in for much the same reasons. Both Spidey and the X-Men deliver on their reliably good characters with a genuine series arc linked closely to Ulysses and the Civil War itself. Previously I was disappointed with the Choosing Sides collection, the first issue (with three mini stories per issue) didn’t impress me as much as the equivalent books from previous Marvel events did, but this week the America Chavez look at the James Rhodes funeral (also featuring Storm, Misty Knight and Spectrum) is arguably one of the most genuine artistic pieces expressed in the pages of a comic book. 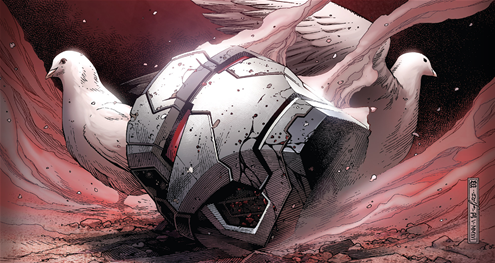 It certainly adds more weight to Warmachine’s death than the main Civil War II book has done on its own. With that said, it’s back to awaiting the next instalments of this comic event for me, thankfully with the joy of eager anticipation yet again.